For Bonnie his life had been lived, and the bitter sweet memories of his wife, along with the never ending sorrow of losing his son so young remain with him, but were now ebbing slowly with the passing of the years. His days of love, warmth and tenderness well past and all that was left were his last few quiet years to grow old. Alone, yet content. What he had done, he had done and what had happened, had. All that remained was to live out the rest of his life in a new place, far away from his checkered past. His days passing with the regularity that an old man desires and deserves. Until the dark day arrives that signals an impending end to his new found life, and with it, all sense of hope. In facing mortality, Bonnie resorts to using his crusty exterior and bravado to hide the frailty and fear he feels within himself, until he is presented with stark realities beyond his understanding and is forced to come face to face with his own prejudices and beliefs. In meeting Danny and Angeline, Bonnie begins to reshape his thoughts about his acceptance of those he had habitually admonished, and of the bigoted life he has lived. While Charlie and his daughter Beatrice realign his set concepts of how he has habitually rushed to judge people too quickly. However, it is only when Bonnie meets Madeleine that the most unexpected eventuality turns his hard held beliefs, and his very set views about life, people and love, on their head. 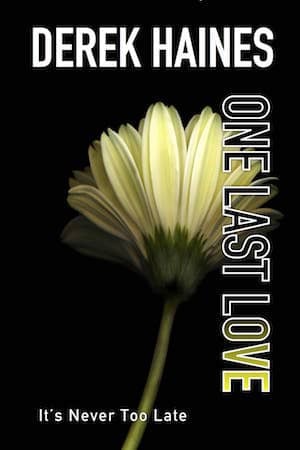 What some reviewers say about One Last Love. While I knew the book couldn’t have a happily ever after in the traditional romance genre sense, I had high expectations when I started reading this. Fortunately I was well satisfied. Without giving away any spoilers, I was pleased on how engaging the hero/heroine interacted with each other and their feelings developed realistically. A level of believability stayed constant throughout the story and it never veered off into the absurd that some romance books do. A solid amount of dialogue mixed in with appropriate setting and I enjoyed it from start to finish. I wasn’t sure what to expect when I began reading One Last Love by Derek Haines. My sister and also a good friend ended their days in a hospice, which left me with very sad memories. However, Derek Haines book revealed a lighter side of life in a hospice, where friendships and even love can blossom. Derek Haines is a born writer and I never know what to expect from him except to expect the unexpected. 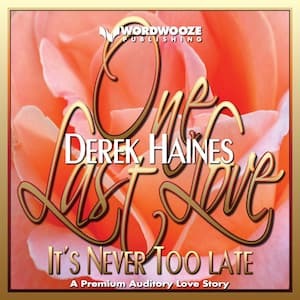 One Last Love by Derek Haines is a sweet, lovely read and I highly recommend it. Bonnie found that out in the end, and discovered love in the unlikeliest of places. I think that being faced with your own mortality can never be easy, and Derek Haines showed remarkable insight when telling Bonnie’s story. Wow, some people have the ability to make you feel the story thought their words and Mr. Haines is one of them. He has an amazing way with words and he drew me into the story and the lives of his characters right away. This is not a typical love story, but one that is drawn from life. The main character is not the loveable perfect hero found in so many love stories. He is a man with imperfections who hasn’t always made the right decisions. At the end of his life, he finds someone who touches his heart and connects with people he never would have connected with before. This is a great read for anyone. Life is so short and this book tells a powerful story of love, forgiveness and acceptance. Now available in audiobook from Amazon, Audible and iTunes!